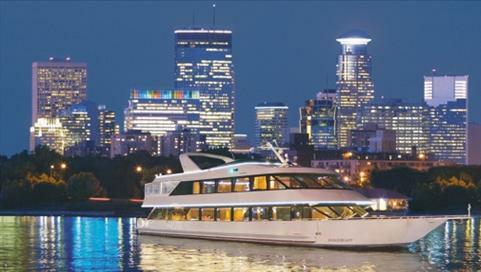 Paradise Charter Cruises offers a fancy fairly affordable date option on the Mississippi River. Their pizza and lock cruise is $23.50 per person. The boat departs from Boom Island Park on the Mississippi River on Wednesday and Thursdays at 6 p.m. now through October 3. Enjoy the narrated cruise on the Mississippi through downtown Minneapolis, locking thru the Upper St. Anthony Falls while enjoying the beautiful Minneapolis skyline. The price includes a pizza buffet and happy hour drink specials with a full cash bar available. Advanced reservations are required. Two hours on a boat with downtown views is worth the $23 to me, but add in free pizza and it is perfection! If you have fancy date ideas in Minneapolis or St. Paul, e-mail livethefancylife@gmail.com to share the love! 2 Responses to "fancy date—Mississippi River boat happy hour"
What a fantastic idea! I am going to get this on my to-do list! I’m getting married on Lake Minnetonka all ;) They are a wonderful vendor to work with!